I'm going to tell you guys about something that I think is pretty cool and that I'm really proud of... my mother, EE Bracken, has written and published two books... not one, but TWO! I know there are some people out there that think writing a book is a piece of cake, but I'm here to tell you, it's not. It's not at all. I've been keeping this blog going for over three years, writing a few times a week, and I still don't have the tenacity to sit down and write a book, so sometimes we have to give props where props are due... writing a book is a big deal. Way to go Eilo (that's my mom). You know what's another big deal, free stuff. And in honor of big deals, I'm giving away a copy of my mother's latest book, Franklin's Spy. 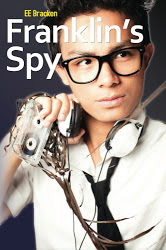 Franklin's Spy is a YA book (like Harry Potter and the Hunger Games) about a gifted boy named Michael whose genius defies logic and who excels at everything he does, so much so that the CIA decide they want him. The problem, the CIA aren't the only ones and soon Michael is hiding away at an elite prep school with a student body made up of the whose who of the global-elites’ children. It doesn't take long for Michael to discover the school is actually a hotbed of international intrigue and before he knows it, he’s globetrotting between Europe and The Middle East where he finds himself smack-dab in the middle of a treacherous terrorist plot that threatens to destroy America. The universe needs a hero and this one is Michael. And check this out, Franklin's Spy is actually the second in a series of books about Michael, and the first, No Place Like Loam, is being thrown in as a bonus prize. So if you win the giveaway, not only do you win a copy of Franklin's Spy, but you'll get a copy of No Place Like Loam as well. Two for the price of one, and the price is free, so there you go. All you have to do for a chance to win, is enter below. and runs until Friday July 19th. Your mom wrote TWO books. Just amazing. Have a nice weekend! I don't think I'll wait for the contest. It sounds like a very interesting pair of books. I think it is so cool that your Mom wrote two books! I admire her for this. And the book sounds so interesting, I will definitely check it out! Great giveaway! Wow! That is so amazing, such a great role model to have in your life too! Congratulations to your mom on her two books! Many of us dream of writing books but few have the ability or the tenacity to see a book writing project through to completion. Sara, I visited your Mom's blog and I know you are very proud.